I'm loving these looks from the *first* solo collection by Sarah Burton for Alexander McQueen (McQueen's assistant for 15 years before his death last year). 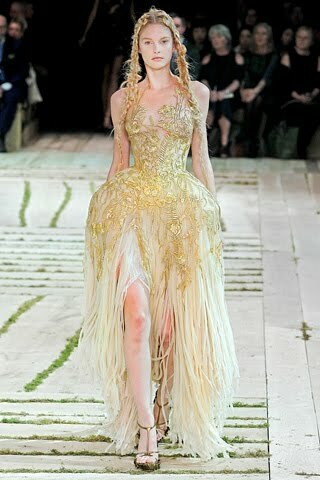 They reminded me of these outfits from past McQueen shows. I think about this outfit a lot. That entire show, titled 'The Widows of Culloden', is my all-time favorite McQueen Collection. See the video here. 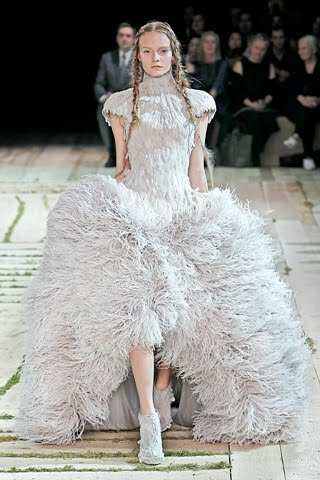 She's pulled together influences from a lot of McQueen's past work, including his recurring bird motifs, the padded hips, and the Atlantis theme from Spring/Summer 2010 RTW. I have to agree with some of the fashion reviews I've been reading, she has softened the house's style around the edges. But I don't like that, really. I'll miss his perfectly sculpted Grace Jones-esque bodices and sharp tailoring. And the FW2010 hair and makeup are totally bland. Why the hippie braids? See the rest of the show here. 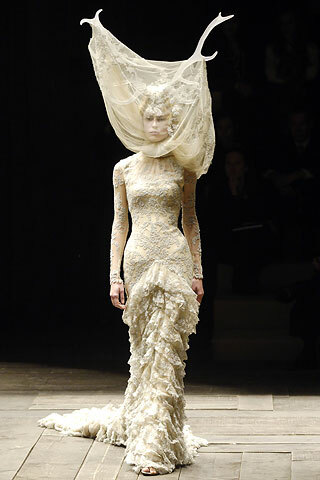 And, there are high-quality videos of runway shows going back to 2002, on the Alexander McQueen website. I'm NOT loving anything from my other usual favorites from the Spring / Summer Ready-to-Wear 2011 collections, except for Dior's 1940s South Pacific-inspired collection. Going against the trend of the last few years, there are not very many hats in these collections, except for these bland, identical Gilligan hats on Dior. 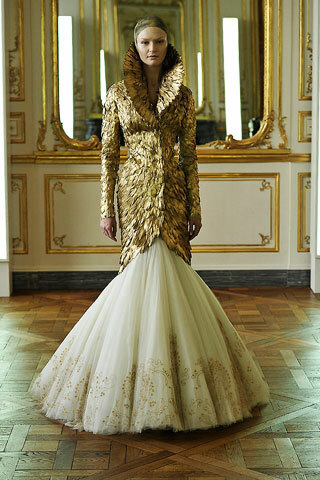 Couture is always more interesting anyway, and more chock-full of hats. Those shows are coming up at the end of January, so there is always hope for the future.